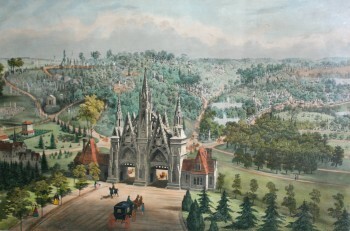 Established in 1838 as one of America’s first rural cemeteries, Green-Wood Cemetery soon developed an international reputation for its magnificent beauty and quickly became the fashionable place to be buried. Among the 560,000 permanent residents are such notables as Leonard Bernstein, Boss Tweed, Charles Ebbets, Jean-Michel Basquiat, Louis Comfort Tiffany, Horace Greeley, and numerous Civil War generals, baseball legends, politicians, artists, entertainers and inventors. Joining these illustrious, infamous and notable personages are legions of Brooklyn’s and New York’s most influential and prominent families such as the Pierreponts, Roosevelts, Jeromes and Schermerhorns, as well the hundreds of thousands of other less well known residents. 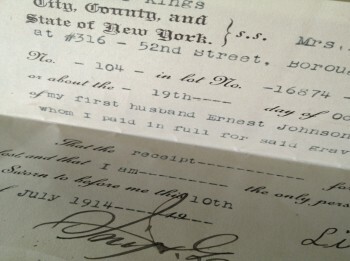 It’s often said, “…one of every seven Americans can trace family roots back to Brooklyn”. Rightly so, for until 1898, the City of Brooklyn was the fourth most populated city in the United States, accounting for the millions of immigrants across the ethnic spectrum that made Brooklyn their home. Ultimately, many of these immigrants were buried in its largest cemetery, Green- Wood Cemetery. In 2013, the Green-Wood Cemetery celebrated its 175th anniversary. Reflective of this long and venerable history of serving the public are voluminous archival records and original source holdings documenting its residents. These records contain the day to day operations of the cemetery and serve to memorialize the people interred there, revealing a vast new store of genealogical and historical information. 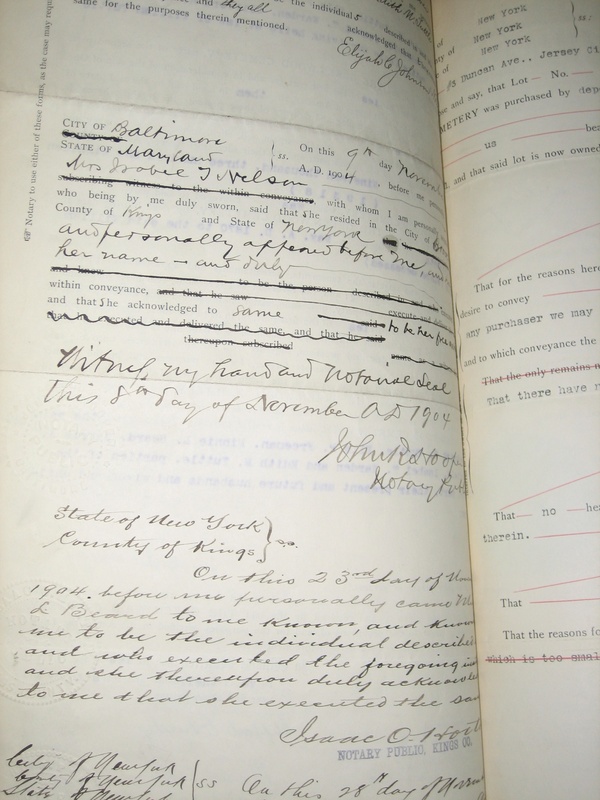 In 2009, the cemetery embarked on a major archival program to organize, preserve and make accessible its records to a wider audience of genealogists and researchers. Since then, hundreds of hours of processing time have been invested in this effort by archival professionals, graduate students and numerous volunteers. Their work has revealed an enormous store of genealogical materials and other information relating to those interred here and their families members. The varied cemetery records abound with genealogical charts, family trees, last wills and testaments, death certificates, burial orders, lot records, family correspondence, and affidavit records. 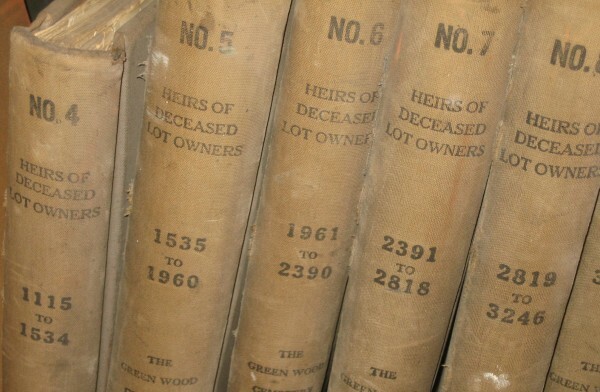 These records are unique to Green-Wood Cemetery and are not to be found in any other repository in the country! In addition to archival sources, the Green-Wood Historic Fund, a 501(c) (3) non-profit organization, established in 1999 has purchased supportive and complimentary historical materials and objects. 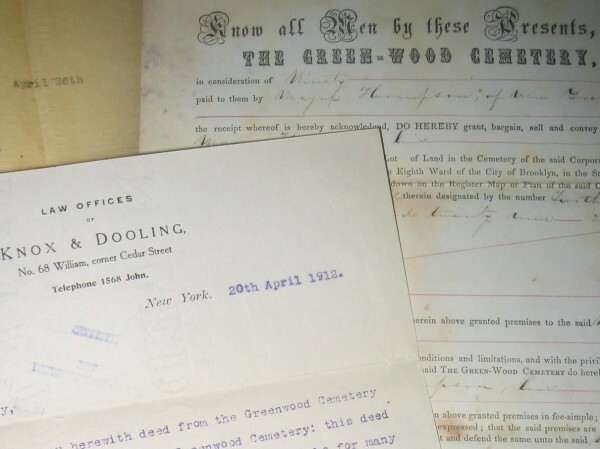 The Green-Wood Historical Collections include early photographs, paintings and drawings, documents, correspondence, maps, posters, and artifacts created, invented or associated with those buried here at the cemetery. This highly specialized collection is also available for research. Now, more accessible than ever before, The Green-Wood Cemetery Archives and Historical Collections afford genealogists new resources for investigation and research paths to travel. We are delighted to assist you in your research with our new and expanded research service. 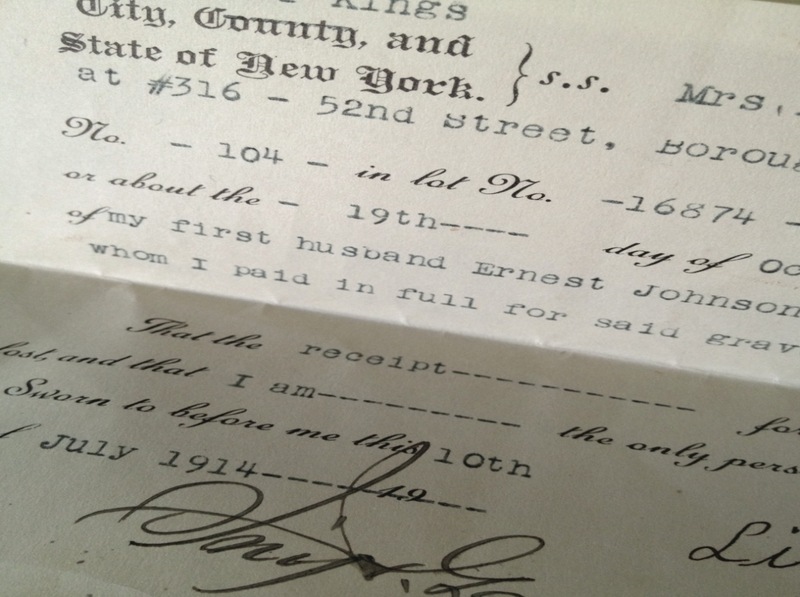 Below are some of our historical records available to the public through our genealogical research service. 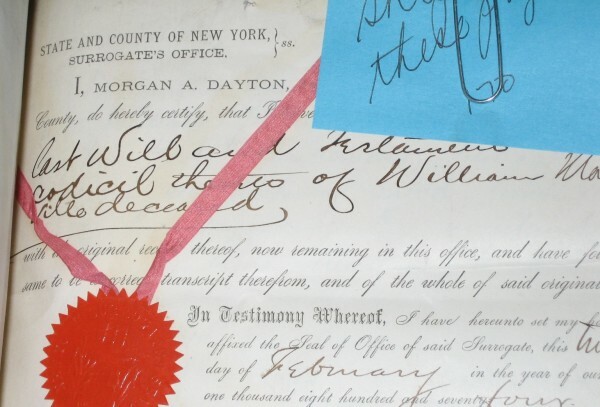 These files contain an array of legal records documenting the transfer of lot ownership and include wills, deeds, affidavits, family and cemetery correspondence, genealogical charts, monument designs and ephemeral materials. The extent and type of materials within each file will vary greatly. Records include detailed notarized legal documents containing lot owner’s name, date of death, and list of heirs. 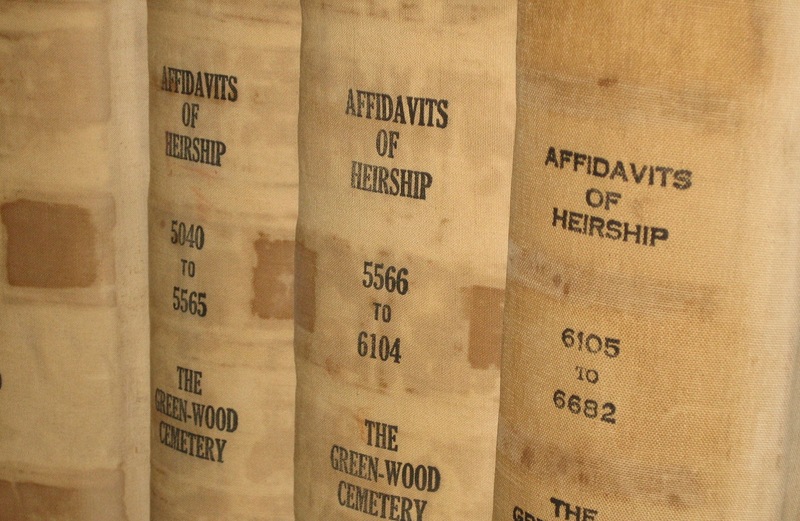 The Memorandum Files contain correspondence to and from lot owners pertaining to the right of burial, maintenance of monuments and lots and includes varied miscellaneous materials, such as newspaper clippings, obituaries and photographic materials. Arranged by lot number, the content of files will vary from lot to lot. 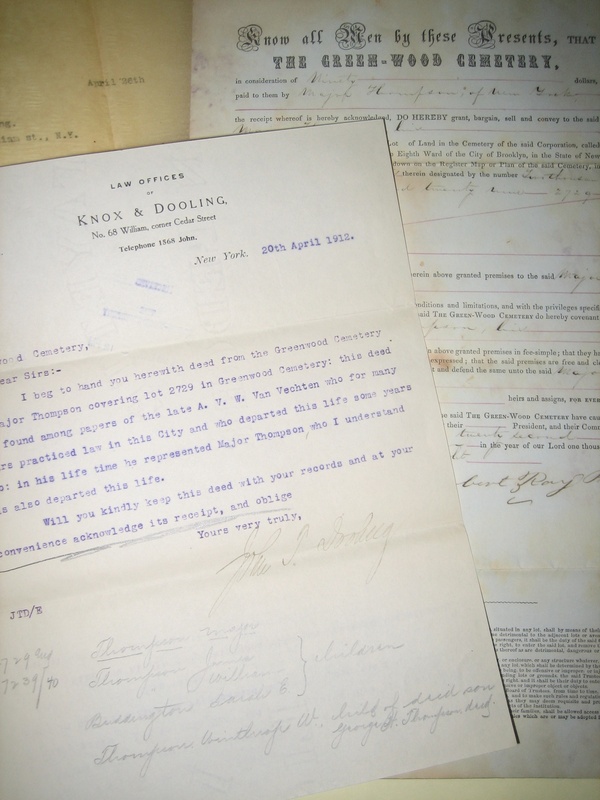 Found within this group of records are last wills and testaments, both originals and copies, manuscript and typescript correspondence between lawyers, families and/or executors of the deceased, maintenance costs estimates and bills, and photographs of lots. Files are arranged alphabetically by surname. The most common record format in this group is the burial permit; a form used by the administrators of the cemetery to document each burial. Files also contain information on the burial lot ownership, name(s) of the deceased, date of death, cause of death, family histories, place of residence and marital status. 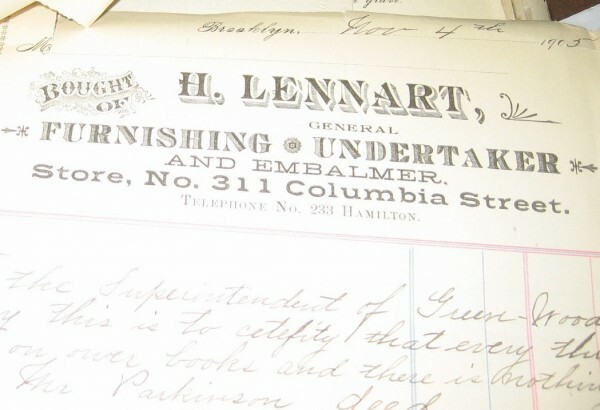 Additionally, files include correspondence between cemetery administrators and lot owners regarding construction of headstones and monuments, blueprints, lot diagrams, death certificates and photographic materials. File contents and types of materials to be found vary from lot to lot. 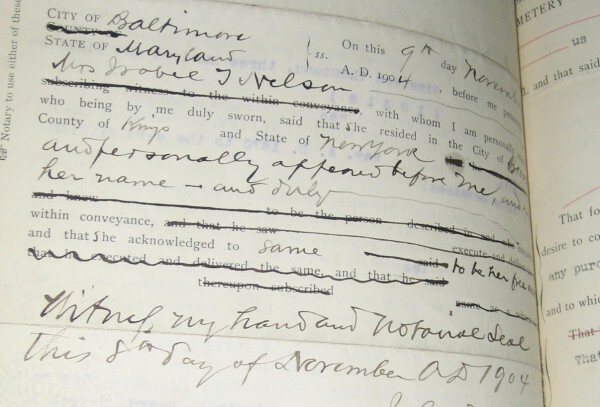 Information contained in these records includes names and relationships of persons who inherited ownership or interest in a lot. Lists date of lot purchases, name of purchaser, address, size of lot, amount paid for lot and notes if an endowment has been deposited with the cemetery for the care of a lot.